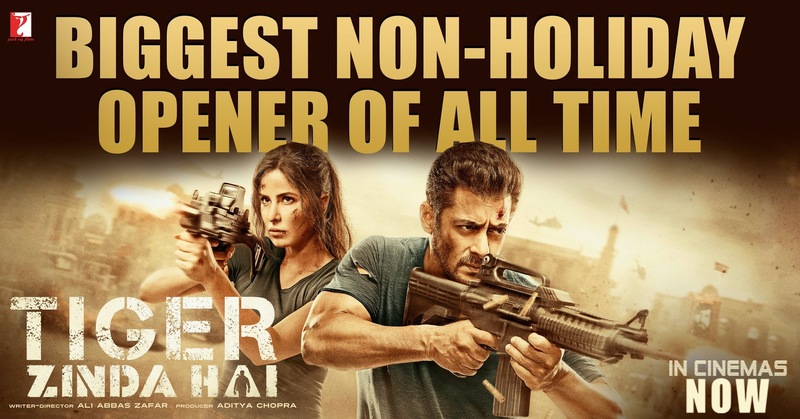 Salman Khan’s mega action entertainer Tiger Zinda Hai has taken a gigantic opening to become the biggest non-holiday opener of all time! YRF’s high octane visual spectacle, also starring Katrina Kaif in the lead, earned INR 33.75 crore nett in India as it raced past the previous non-holiday record held by Dhoom 3 (also a YRF film). Directed by Ali Abbas Zafar, Tiger Zinda Hai has Bollywood’s biggest action hero attempting to take down an army of enemies as he goes on an impossible mission to save nurses held as hostage in war-torn Iraq. The film opened to outstanding reviews from audiences and fans and the business is expected to exponentially grow over the huge Christmas holiday weekend. Tiger Zinda Hai opened to a massive 5700 screens worldwide, with India Screen Count being a mammoth 4600. 16 queries in 0.570 seconds.